Amid the harsh days of winter chills while waiting for the warmth of spring to finally arrive, amid the slow-starting election campaigns in France and the United States that have so far failed to ignite any flames of enthusiasm, a sports story has erupted in the U.S that has warmed hearts around the globe. Jeremy Lin has created a sensation. 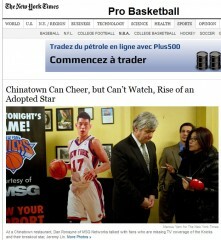 The New York Times had 11 articles about him in five days; Linsanity is front page news. For an athlete, the importance of sports is evident. For the non-athlete, the importance of sports is debatable. For the sociologist, the importance of sports is undeniable. Servette FC is part of Geneva's community. Although the number of people who attend games is relatively small, a large segment of Geneva residents follows the trials and tribulations of their home team, both on and off the field. Servette unifies all elements of Geneva's cosmopolitan population. As for Xamax and Sion, they are integral parts of a sense of belonging of entire regions; the Valais roots for Sion, the Jura is (was?) behind Xamax.